Buying outdoor furniture needs both investment of money as well as some amount of thought and energy. Selection of the outdoor furniture depends on various factors. The furniture should be strong in strength while light in weight at the same time so that it can be moved from one place to another very easily. But these are not the only things that you have to consider. There are other important things also that you need to consider as well. The following tips will assist you in choosing the best quality timber outdoor furnishings for your own home. Hardwood is the more durable form of wood than softwood for creating outdoor timber furnishings. Timber furniture constructed out of hardwood is more long-lasting, due to its durable nature. However, they are also more expensive as compared to those made of softwood. When you buy outdoor timber furniture keep in mind that it comes with some sort of protection for UV rays. Otherwise, you will end up with sun-burnt furniture – much to your displeasure and the embarrassment of guests at your home. UV rays can damage the surface of your furnishings as well as make their fabric fade away. 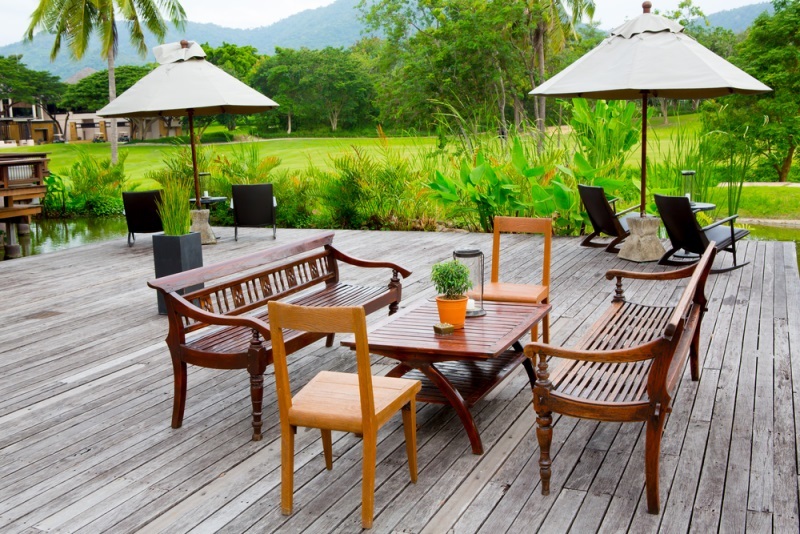 Although outdoor furnishings made of timber do not get damaged by the UV rays so easily but one day or the other, ultimately they too will exhibit signs of prolonged exposure. Naturally, you should buy furniture that comes with enough UV protection. Doing this will ensure that your furniture enjoys a longer life span. Using water from hosepipe to clean your furnishings everyday can also result in damage. That is why it is important to get a furniture that can withstand water as well as other elements – that is it should be weatherproof. Even if you buy waterproof furniture, do not allow your furniture to get soaked in water for long time as it will reduce its water resisting capability and ultimately the furnishings will also start getting damaged. In usual cases, your furniture will not be affected by water. If you want to opt for superior furniture then always check what kind of wood has been used in building it. Oak and teak are two important types of timber used in making outdoor furniture. These are strong and can withstand elements quite well, and last for a long time to come. You can find some of them lasting for several decades. There are lots of manufacturing companies that are into this business of producing high-quality furnishings for the outdoor environment. When you are going to buy new outdoor furniture, make sure that you go for a reputed brand which is known for the production and sale of high quality, durable furniture sets. You can ask for referrals from friends and relatives to know about the best timber furniture makers in the market. You can also check web store pages for different outdoor furniture items made of timber from varied brands and take a look at the comments and feedbacks from customers. This is a good way to understand which of the brands is the best.